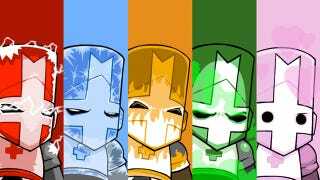 Because you demanded it, medieval beat 'em up Castle Crashers is getting a new brawler armed with a lollipop and equipped with pink armor. The best part? The new Pink Knight is for a good cause. Next week, the PlayStation Network version of The Behemoth's Castle Crashers will introduce the lovable, adorable Pink Knight, yours for just $1.99 USD. Proceeds from the Pink Knight Pack, which also includes four brand new weapons, "will be donated to charities devoted to Breast Cancer Research," according to The Behemoth. Owners of the Xbox Live Arcade version, you're getting the Pink Knight too. Just not yet. Watch this space!